Inter have reportedly identified Duvan Zapata as a possible replacement for Man Utd and Real Madrid transfer target Mauro Icardi. As noted by BBC Sport, the Argentine forward lost the captain’s armband on Wednesday as Inter officially announced that it was being passed on to goalkeeper Samir Handanovic. 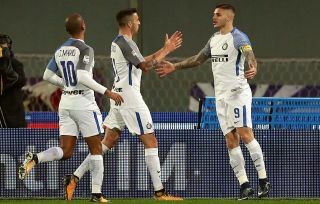 Further, coach Luciano Spalletti later revealed that Icardi pulled himself out of the squad to face Rapid Vienna in the Europa League on Thursday, leading to serious question marks over his future at the San Siro. Calciomercato note that Man Utd and Real Madrid are said to be among the clubs interested in the prolific forward, who will have an active €110m release clause between July 1 and July 15 this summer. Their hopes of signing the 25-year-old, who has scored 122 goals in 210 games for Inter, could now have been given a real boost as Goal Italy report that Zapata has emerged as a target for the Nerazzurri to fill the potential void left behind by Icardi. The Atalanta ace is having quite the season this year, having scored 21 goals in 31 appearances in all competitions, as he appears to have finally started to realise his full potential. It’s even suggested that Inter have already held talks with their Serie A rivals over a possible move in the summer, and so it remains to be seen whether or not an agreement can be reached in the coming months. Should that materialise, that will surely alert United and Madrid to the situation, as that would essentially suggest that Icardi will move after what has been a contentious campaign in general. Aside from the controversy off the pitch this week, he is currently on a goal drought in Serie A, which has seen him go seven games without finding the back of the net. That in turn has contributed to Inter being dragged back into the race for a top-four finish this season, and so with speculation rife over his future, Icardi could be on his way out this summer with Man Utd, Real Madrid, Paris Saint-Germain and Juventus all named as interested parties in the Calciomercato report above.